Mr. Steinberger, by nature a perfectionist, did rather well in law school (see, c.v.), then clerked for a United States District Court judge, and was recruited by some of the largest, most prestigious law firms in the country. During this time he went through his own nasty divorce and said to himself, “There’s got to be a better way.” He now dedicates his life to practicing that better way, bringing large-firm professionalism, practice and polish to the area of matrimonial and family law. Mr. Steinberger continues to study litigation, negotiation and mediation so as to employ the latest and best techniques in each of these and other areas for the benefit of his clients. 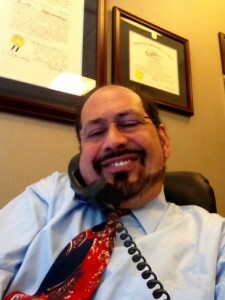 He serves as an arbitrator judging disputes in Small Claims Court and other venues. There, and through his service as a law clerk and mediator, he sits in the “middle” of others’ disputes, and gets to “feel” what arguments are persuasive and compelling and which fall flat, making him a better advocate, litigator and negotiator. As detailed in his article, Mediation Techniques Every Litigator Can Use, Mr. Steinberger also uses his mediator’s techniques when he’s advocating for his clients, sensing where an opening for resolution might lie, and then finding ways to achieve consensus to his client’s advantage. Because of his own experience, Mr. Steinberger knows the pain of divorce and feels like each case is his own. He “lives and dies” with every case and several have said that he’s “changed [their] li[v]e[s].” (See What Clients Say About Chaim.) He spends a lot of time with his clients learning about their issues, explaining the law and how the system works so as to empower them. (See, e.g., It Takes Time-I and It Takes Time-II), and developing a cohesive strategy to achieve the client’s objectives (see, Developing a Theory of the Case(coming soon!). “Committed to excellence,” Mr. Steinberger treats everyone with dignity, courtesy and integrity. He has proven that though behaving with integrity in litigation and negotiation may require more time, the clients ultimately benefit by it. (See, Good Lawyers Never Lie (coming soon!) and What Clients Say About Chaim.) Though a bulldog litigator, he treats even his adversaries with fairness, courtesy and dignity usually to the benefit of all. Mr. Steinberger was recently appointed to the Executive Committee of the New York State Bar Association Family Law Section, and elected to the Council (the governing body) of the American Bar Association Family Law Section. He’s co-chaired the Ethics, Disciplinary & Grievance Committee of the American Bar Association’s Family Law Section for many years and was involved in several other bar association ethics committees. (See, Bar Leadership Positions.) He published an article for lawyers Make More Money by Being More Ethical, and lectured at ABA seminars, (see Lectures) showing lawyers how good ethics are also good business practice. By studying and implementing the best practices of LPM (“law practice management”) CHAIM STEINBERGER, P.C., continues to develop, expand, and utilize forms that make the practice efficient so as to give its clients maximum value for the legal fees they incur. As a client of CHAIM STEINBERGER, P.C., you will gain the benefit of the forms created for the many clients before you. His many years of intense Talmudic study have made Mr. Steinberger quick on the uptake, able to analyze contract provisions, holdings of cases and even implicit and reverse holdings of case, and able to efficiently develop winning Theory of the Case. Mr. Steinberger believes that it’s important for each of us to give back and to work together to make the world a better place. To that end he volunteers at several organizations, (see Public Service), and publicly lectures on issues of law, love and dispute resolution (see Lectures & Presentations or download this List of Lectures for a partial list of topics that Mr. Steinberger is available to lecture on).